Mathew Joy 1 month ago. Android Nougat 7.1 ROM, Lineage OS 14.1 for Galaxy Tab 4 10.1 WiFi has now arrived via an UNOFFICIAL build. This Galaxy Tab 4 10.1 WiFi Lineage OS 14.1 is brought to you by developer thisisapoorusernamechoice and another build is by gpancot. If you want some more Lineage OS ROMs or wanna taste the OFFICIAL Lineage OS build then stay tuned to the Lineage OS 14.1 ROM collection page. Or if you are looking for other Nougat ROMs, then here is the CM14.1 for Galaxy Tab 4 10.1 WiFi. THIS IS AN INITIAL BUILD WHICH MAY HAVE MANY MORE BUGS THAN YOU CAN IMAGINE. HAVE A BACKUP BEFORE FLASHING THIS AND TRY AT YOUR OWN RISK. Installing a custom ROM on a Galaxy Tab 4 10.1 WiFi (matissewifi) may require the bootloader to be unlocked, which may VOID your warranty and may delete all your data. Before proceeding further you may consider backup all data on the phone. You are the only person doing changes to your phone and I cannot be held responsible for the mistakes done by you. Download and Copy the GApps and Lineage OS 14.1 for Galaxy Tab 4 10.1 WiFi ROM ZIP to your phone. First flash the Galaxy Tab 4 10.1 WiFi Lineage OS 14.1 ROM ZIP from device. Then flash the GApps zip from your device memory. Reboot and Enjoy the Nougat 7.1 Lineage OS 14.1 ROM for Galaxy Tab 4 10.1 WiFi (matissewifi). 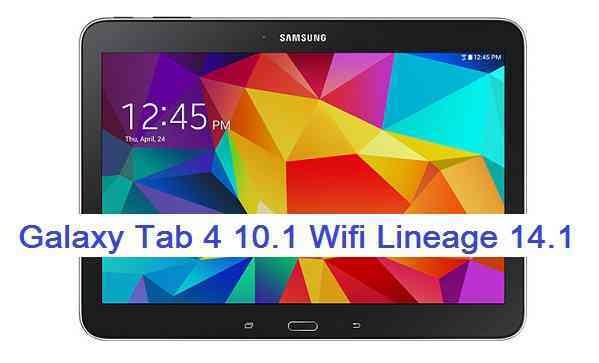 Copy the latest Lineage OS 14.1 for Galaxy Tab 4 10.1 WiFi ROM ZIP file to your phone. Stay tuned or Subscribe to the Galaxy Tab 4 10.1 WiFi (matissewifi) forum For other Android Nougat ROMs, Lineage OS 14.1 ROMs, other ROMs and all other device specific topics. So it seems this 14.1 rom has been downloaded 1200 times. Anyone care to give feedback? Is it usable? Any newer signs of an official rom on the horizon? My set-up is still back at android 4.4.2 (have worked on getting tarp onto it, and getting it rooted, but that not quite there, and newly available Ota updates being refused due to this) so I’m keen to get the whole los thing sorted. Also not sure if there is a more specific Los site to look into this. Google group seems to send me back to this cm site with the text all targeting Los, but it’s looking slightly stale. I’ve tried this update a few times, but keep getting the dreaded “KERNEL IS NOT SEANDROID ENFORCING” after installing Lineage OS (lineage-14.1-20170319-UNOFFICIAL-matissewifi.zip from here) and GApps (open_gapps-arm-7.1-nano-20170807.zip). I only have Linux or OS X, so Odin (//www.cyanogenmods.org/forums/topic/install-twrp-recovery-samsung-android-using-odin/) doesn’t work (and JOdin3 does nothing when it says “running”) and I’ve been using Heimdall per the instructions (fastboot //www.cyanogenmods.org/forums/topic/install-twrp-recovery-android-using-fastboot/). I’ve tried both the instructions here and https://wiki.lineageos.org/devices/n1awifi/install (where I started, then found this thread after the Heimdall said the n1awifi does not support my hardware: Samsung Galaxy Tab 4 10.1 SM-T530NU). I tried both the twrp-3.0.3-0_matisse_20170122-0641.img linked here and the latest twrp-3.1.0-0-matisse.img from the TWRP website (https://twrp.me/devices/samsunggalaxytab4101.html), with the same effect. Luckily I took a full backup and restoring the prior OS (Android 5.0.2) via TWRP recovery works. I was unable to find an “OEM Unlock” option in the Developer settings of the OEM provided Android OS and “fastboot oem unlock” just says “waiting for device” and “fastboot devices) says no devices when in OEM OS, Download mode, or Recovery mode. EDIT1: I should note that the “KERNEL IS NOT SEANDROID ENFORCING” should not be an issue (per https://www.reddit.com/r/LineageOS/comments/6n7lpa/flashed_the_latest_los_and_now_my_phone_says/), but this is where my device is stuck after flashing this Lineage OS 14.1 image. As a follow-up, using the Resurrection Remix image from https://forum.xda-developers.com/tab-4/development/rom-resurrection-remix-5-8-0-t3544283 (@thisisapoorusernamechoice’s RR-N-v5.8.2-20170311-matissewifi-Unofficial posted at https://forum.xda-developers.com/showpost.php?p=71398881&postcount=45 ) and the same steps/instructions I was able to get that image to load and boot, still shows the “KERNEL IS NOT SEANDROID ENFORCING” error at boot, but then loads the boot image with animated “Get Resurrection” animated logo. i had the same problem like Eric with the release 20170319. It ends into a bootloop. I took the older release 20170122 and it works fine. I get the message “KERNEL IS NOT SEANDROID ENFORCING” too by starting the device but the system works fine. Note: Made it with Odin under Windows 10. I have similar problem as ahmedrafiq. Camera and sound recording doesn’t work. When powered off and charging, I get the charge icon, but I think it gets hung. I then have to hard reboot to use again. Didn’t test Bluetooth and GPS. I am using 2018 v. But….I am not much bothered about the bugs, not using those features anyway. I am happy that the tab got upgraded (Samsung told they are no more issuing any more updates) from Android 5.1 (almost unusable state…System UI error and other issues) to 7.1. Maybe I can use it a couple more years. @minty95 Thank you for the link. I have updated that on the main downloads section. The new build came on 29th August 2018. I have added a new build file of Lineage OS 14.1 for the tab built by gpancot. As reported by @minty95 this is more stable than the other. You can try this one and let us know how this goes on your device !